Doomsday emerges from an underground bunker and encounters the Justice League International. He easily defeats them, but Superman arrives and the two fight across the country. Lois Lane and Jimmy Olsen are sent to cover the battle for television, while Lex Luthor dissuades Supergirl from joining the fight and convinces her that she is needed in Metropolis. 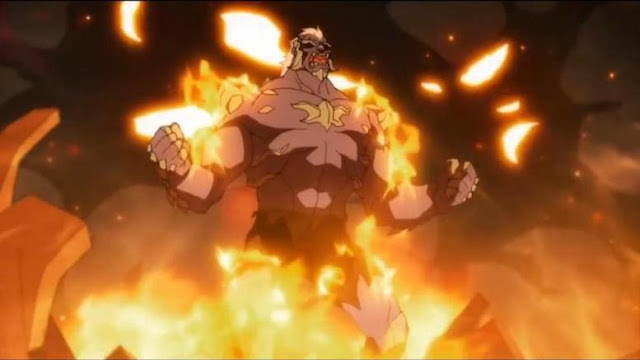 Doomsday sees a commercial for a wrestling show being held in Metropolis and heads for the city. Superman engages Doomsday and throws him, where he lands on the mountain housing Project Cadmus and leaps toward Metropolis. Supergirl goes to Superman's aid, but a single punch from Doomsday knocks her to the ground. Professor Emil Hamilton and Bibbo Bibbowski, Superman's allies, fire a laser cannon at Doomsday, but it does not harm him. Doomsday and an exhausted Superman fight and strike each other with so much force that the shockwaves from their punches shatter windows. 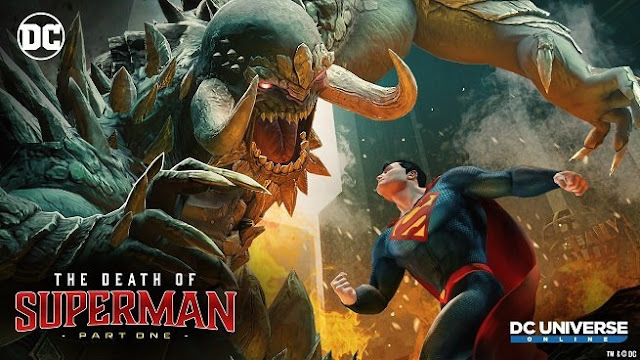 At the struggle's culminating moment in front of the Daily Planet building, both lay a massive blow upon each other, killing Doomsday and mortally wounding Superman. In the arms of a frantic Lane, Superman succumbs to his wounds and dies. Jimmy, Ice, Bloodwynd, and Guardian are also present at the end, with Jimmy bitterly photographing the images of Superman's fall. The world is stunned and traumatized by Superman's death. A mausoleum is built in Metropolis in his honor, provided by Luthor, who says that if he could not kill Superman, then the least he wants is to bury him. His funeral is attended by nearly every single superhero, as well as some supervillains and Bill and Hillary Clinton. Every hero wear a black arm band featuring Superman's S-shield logo. After the funeral, Project Cadmus steals Superman's body from his mausoleum, allegedly to clone him. The body is recovered by Lane and Supergirl. With Superman gone, the crime rate rises and the costumed heroes of Metropolis rise to fill in as protectors. Supergirl, Gangbuster, Thorn, and a team funded by Luthor all try but are insufficient. Jonathan Kent, Superman's adoptive father, takes his death the hardest. One night, while reading a newspaper story written by Lane in honor of Superman, Jonathan begins to feel responsible for his son's death and has a heart attack in his wife Martha's arms. While in a coma, Jonathan meets Superman and convinces him to come back, before reawakening. 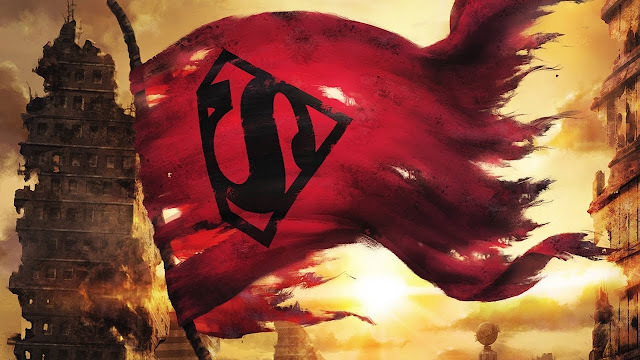 Coinciding with the awakening is the arrival of four men—Steel, the Cyborg Superman, Superboy, and Eradicator—who claim to be Superman and Lane's discovery that his grave is empty. Steel and Superboy are disproven as the original Superman, but the Cyborg and Eradicator both seem to recall memories he had. Hamilton tests the Cyborg and states he is the real Superman. In actuality, Eradicator stole Superman's body and placed it in a regeneration matrix in the Fortress of Solitude, drawing on his recovering energies to power himself. A powerless Superman, wearing a black costume, escapes the matrix. The Cyborg helps Mongul destroy Coast City and begins to build Engine City in its ruins. Superboy asks Steel to help him fight the Cyborg. Superman and Supergirl join the two and they travel to Engine City. During a fight, the Cyborg launches a missile at Metropolis with the intent of destroying it and putting a second Engine City in its place. Superboy manages to stop the missile before it strikes Metropolis. Hal Jordan returns from space to find Coast City destroyed. Devastated, Jordan immediately attacks Engine City and defeats Mongul. Meanwhile, Eradicator joins the fight and shields Superman from Kryptonite gas. The gas interacts with Eradicator before passing into Superman, allowing Superman to regain his powers but causing Eradicator to die. Superman then defeats the Cyborg. Supergirl uses her powers to reconstruct Superman's original costume, and they return to Metropolis.